At Timberhill Athletic Club we offer swim lessons for children of all ages, kids swim workout, and a variety of open-swim times for families to enjoy the pool together. This class is offered for children 6 months to 3 years of age and their parents. Water babies teaches both water adjustment as well as the beginning skills for swimming, through songs and games. It is a fun way to bond with your baby and learn important life skills at the same time. For more information, contact AnnaMarie Ulrich at 541-757-8559. Group lessons are offered year round at Timberhill Athletic Club. Classes are available for all ages and ability levels. Classes are offered Monday/Wednesday or Tuesday/Thursday in the late afternoon and evenings and meet for 1/2 hour each day for 7 weeks. There are 4 or fewer students in each class. Private and semi-private lessons are also offered throughout the year. We design these lessons to fit into your schedule. Take as many or as few lessons as you want with no long term commitment required. For more information, please contact AnnaMarie Ulrich at 541-757-8559. One-Two-Three-Jump! 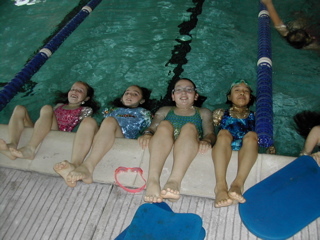 This supervised lap swimming class, offered to kids able to swim laps, is a blast! Kids have fun while improving their stroke, breathing, and endurance. Participants must be able to swim at least one lap, using any stroke, in the big pool. KSW is not a swim team. It is a group of kids who like to swim for the fun, and the health of it. There is no registration or fee for members to attend this class. Students may drop in at any time to enjoy a supervised swim workout. Visit the SCHEDULES page for Kids Swim Workout days and times. Come swim laps together or just splash around with your kids in the warm pool during Family Swim hours.